Now, anyone who has ever moved knows how much work it is. And it's always way more work than you think it is. Day turns into night and, well, sometimes you need a break for refreshment. 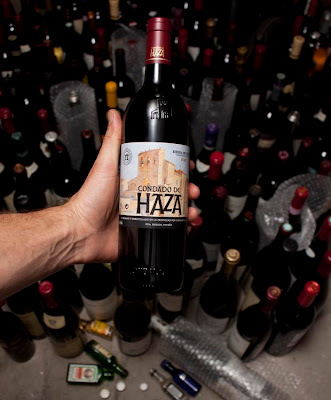 So, you've got a warehouse full of great wine and you're packing to move. What do you reach for? A shot of liquor to get you through the last hump of box packing? Perfectly understandable. But the selection is curious: Jaeger, Jameson, Jack Daniels, and Skyy vodka. An assortment of mini bar bottles ﻿that someone lifted from that Hilton? Whatever you're drinking to get yourself over the hump into the weekend, enjoy!